By default only one item can be selected from the popup list. For multiple selection, you have to enable checkboxes. The selected item consist of active class (“e-active”) to differentiate it from other items. The following API’s, select the items in the DropDownList via text or value or indices. To select an item initially, you can pass the item’s value via value property. Multiple items can select via value property, the given values should be separated by delimiter character. To select an item initially, you can pass the item’s text via text property. Multiple items can select via text property, the given values should be separated by delimiter character. Select a single item by passing an index value to the selectedIndex property. Select more than one items by passing index values to the selectedIndices property when multi selection enabled. Index starts from 0 here. To use “selectedIndices” property, you should enable with showCheckbox or multiSelectMode property. The following methods, select the items in the DropDownList. This method is used to select the list of items in the DropDownList through the Index of the items. This method is used to select an item in the DropDownList by using the given text value. This method is used to select an item in the DropDownList by using the given value. The following methods, used to retrieve the items from the DropDownList. This method is used to retrieve the items that are bound with the DropDownList. This method is used to get the selected items in the DropDownList. This method is used to retrieve the items value that are selected in the DropDownList. To select an item initially you can pass the item’s value via value property or selectItemByValue method. To achieve this DropDownList widget must be initiated with the associate value. To retrieve the selected item’s LI elements and value you can use getSelectedItem, getSelectedValue methods respectively. //create an instance from an existing DropDownList. // only after control creation we can get dropdownObj otherwise it throws exception. You can select a single or more than one item by passing index values to the properties selectedIndex or selectedIndices respectively. Index starts from 0 here. To use “selectedIndices” property, you should enable either showCheckbox or multiSelectMode property First. Similarly, you can unselect a single or multiple items by using unselectItemByValue or unselectItemByIndices or unselectItemByText methods. This will remove the selection state of the corresponding data item from the popup list and textbox. 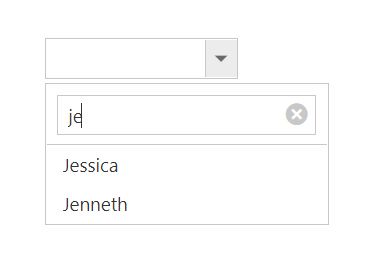 The DropDownList items can be categorized by using a specific field in the popup list. This is enabled by using groupBy field on data source binding. 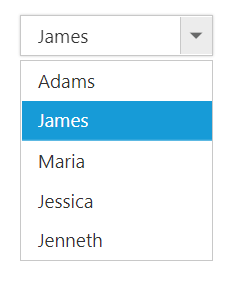 By default grouping is disabled in DropDownList. The below given example explains the behavior of grouping with JSON array binding. Virtual scrolling is not supported with Grouping. Sorting is enabled to order to display the items alphabetically in either ascending or descending order. 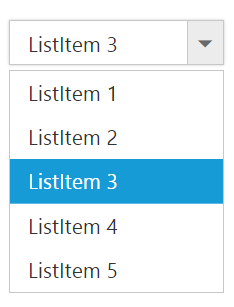 By default the items is displayed in the initialized order, use enableSorting property to automatically sort strings based on text field value. You can assign either “ascending” or “descending” string values to the sortOrder property to sort out the list items. By default ascending order is followed when “sortOrder” property is not specified. Virtual scrolling is not supported with Sorting. 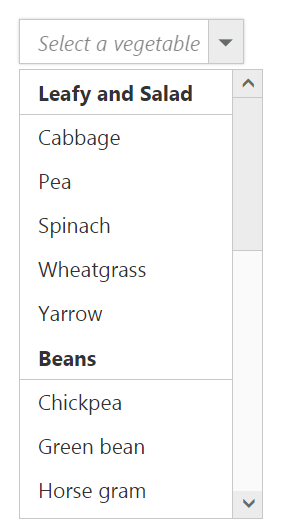 This works for series of DropDownList in which items are filtered based on the previous DropDownList‘s selection. Cascading is performed based on the value field and this field should be bounded with a foreign key. To perform cascading, specify the child DropDownList’s id in cascadeTo property and use delimiter (“,”) to specify more than one child DropDownList. Selects the item in the popup list based on the keyed in value. If the time taken to type exceeds 1000 milliseconds then filtered items will be reset based on the current input value. By default this mode of search is enabled. Incremental search can be case sensitive or case insensitive. To make case sensitive, you can use caseSensitiveSearch property. You can quickly locate specific item within a large data source by filtering matches with a search box. A text box appears in the popup list for searching when enableFilterSearch property is enabled. By default, filtering returns the matched items list based on text in search textbox. Items are filtered based on “contains” filter type by default. You can validate the DropDownList value on form submission by applying “validationRules” and “validationMessage” to the DropDownList. jquery.validate.min script file should be referred for validation, for more details, refer here. The validation rules help you to verify the selected text by adding validation attributes to the input element. This can be set by using validationRules property. You can set your own custom error message by using validationMessage property. To display the error message, specify the corresponding annotation attribute followed by the message to display. 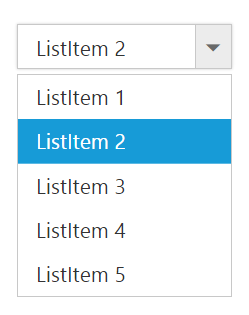 When you initialize the DropDownList widget, it creates an input hidden element which is used to store the selected items value. Hence, the validation is performed based on the value stored in this hidden element. Required field and min value validation is demonstrated in the below given example. ignore: ,// To include hidden input validation.